On our morning trip to the pond LP and Mom both snacked on cherry tomatoes from the garden. Dinner: One of my favorite dinners (that Dad makes!) Callaloo (or spinach) with tomatoes, ginger and garlic atop grilled polenta. Yum yum! We were in the mood for dessert tonight and I had seen some chocolate chip shortbread cookies at Whole Foods (not vegan) that looked really good. I decided to try and adapt a recipe from Vegan on the Cheap that normally required more rolling out of dough and dipping it in melted chocolate. I wanted to make these cookies super easy to make since my time was limited – IP needs to eat of course! 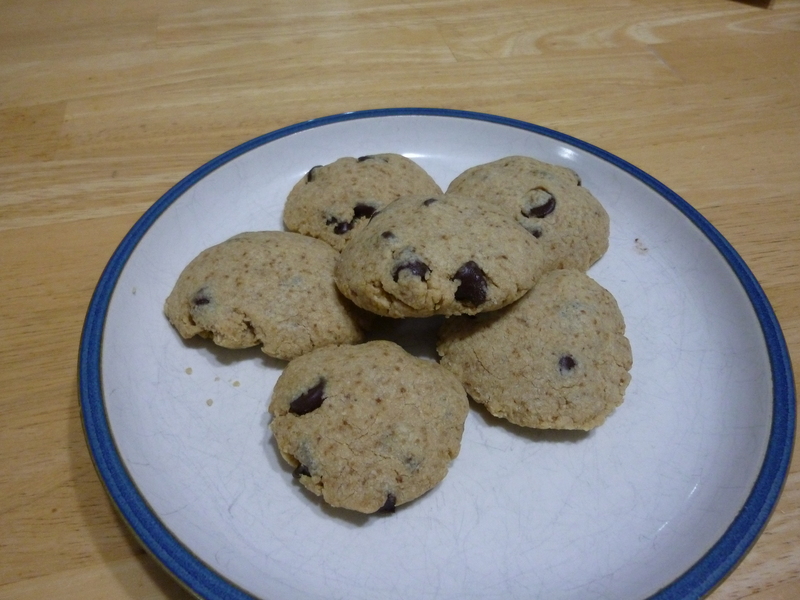 The result were some easy and very yummy cookies! 2) Using an electric mixer, cream the butter, tahini and sugar. Mix in the vanilla. 3) Add in the flour 1/2 a cup at at time using the electric mixer for the first 3/4 of the flour. Stir in the last 1/2 cup with a wooden spoon. Then, mix in the chocolate chips. The dough will be a bit grainy. 4) Scoop 1 1/2 TB of dough into your had. Squeeze it into a ball, and then flatten it with your hand. Place on a cookie sheet lined with parchment paper, and bake for 14-16 minutes.